Hans Guggenheim is a renowned artist, illustrator, anthropologist and scholar. A few highlights of Hans’ career include traveling the world for LIFE magazine as an artist–reporter in 1956 and founding ProjectGuggenheim, a foundation that helps to establish art programs for young people around the world. The exhibition, entitled “Sketchology” includes the artist’s recent drawings from the series “Newtown Massacre”, “Mythic Monsters” and “Coconuts”. Prior to the gallery reception, Hans gave a lecture on the history and tradition of sketching, from prehistoric drawings to most recent 3-D renderings. The talk took place in the Yamawaki Auditorium. 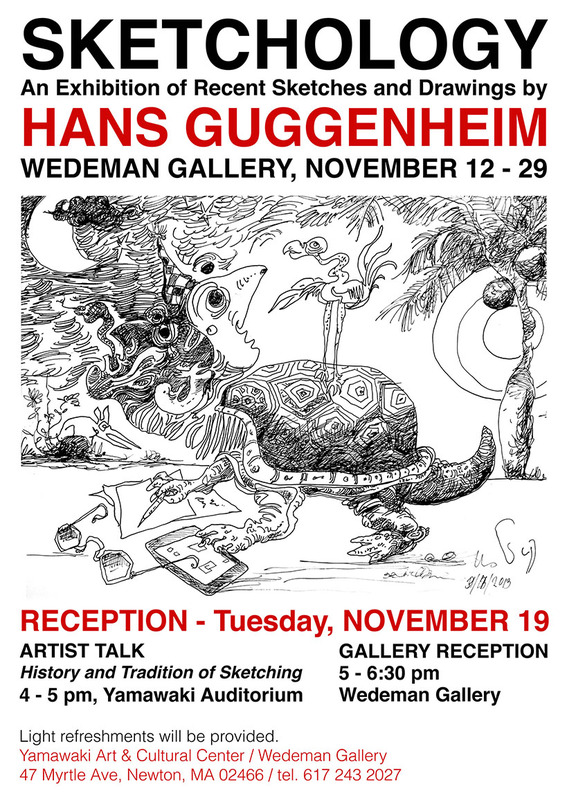 A catalog of Hans Guggenheim’s work, specifically created for the Wedeman Gallery exhibition, is available for purchase.